Went to visit an aunt this afternoon with my parents. I saw her at my big birthday party in April and when my parents told me that they would visit her today in her new appartment I asked if it was okay I'd come along too. It was fun talking about stuff that is going on in the family. 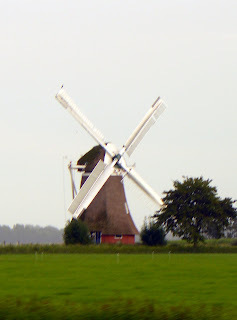 When we went back home I took some photos of a windmill out of the window of the driving car. It was actually raining (for a change) so that's why the trees in the distance look grey. And this evening I had to pick up Zander from the farm where he stayed over the weekend. 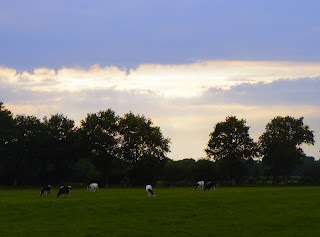 On the way over there I saw this sky over a meadow with cows. I also took this photo when the car was driving. And no I'm not a reckless driver ... my dad was driving the car!